Looking back on my childhood of the 70's and 80's, I seem to remember that nearly everyone, Christian or non, participated in Halloween. When I was a kid, the only family I remember that didn't recognize Halloween was a very strict Catholic family that lived across the street from us. We children thought it rather odd that they didn't give out candy and we especially enjoyed knocking on their door all night knowing that, though the lights were off, they were certainly home. What will you do this Halloween? Fearing the worst on an evening many Christians believe celebrates the wiles of the devil, some will choose to have no part in the traditional neighborhood trick or-treating that accompanies the 31st of October formerly known as All Hallow’s Eve. This boycott of neighborhood dress-up and doorbell ringing is relatively new on the Christian scene, at least in my experience. As a child in an evangelical Christian home, I was right in there with all the other gremlins and witches on our block trying to scare as many Snickers bars as I could out of our neighbors’ stashes and into my bulging pillow case. And you can be sure that every home on my block was always duly prepared to be scared by us. The anti-Halloween movement among Christians didn’t catch my attention until after my own kids had outgrown this annual neighborhood siege. So you can imagine the shock and surprise on the face of the pastor’s wife who came up to me after a talk on Christian worldview I gave last November and wanted to know what I did with my children on Halloween. When I told her I helped them into their costumes, put on a monkey mask, turned up “Ghostbusters” on the stereo, and hit the streets with the express purpose of scaring all the neighborhood ghosts and goblins before they scared me, her face turned white. Apparently what was okay for my parents in 1958 and me and my wife in 1988 was no longer acceptable Christian behavior in 1998. The more acceptable Christian thing to do on Halloween now is to close up the house and have an alternative party for our kids at church. This is usually around a harvest or a biblical character theme--no ghosts or goblins allowed. Though I understand how this safer alternative came to be, I wonder whether a blanket boycott is the only way to handle this controversial holiday. Is this just one more time when we Christians isolate ourselves from culture for religious reasons apparent only to us? Have we really thought through what our dark houses are saying to the rest of the block? While we’re off having our alternative party, I can hear the neighborhood kids shuffling by our house, saying, “Don’t go there, they don’t give anything.” Is this what we want to be known for in the community--a dark house on the one night you can be guaranteed neighbors will visit? My kids are older now but when they were little, Halloween in the Massachusetts town they grew up in was nothing short of an informal neighborhood progressive party. I’d start out with my immediate neighbor and his kids and then run into other parents standing outside other houses. Soon we were a small crowd making our way up and down the street while tired little feet slogged through the fallen leaves of October. By the time the kids had filled their bags, I had been in and out of a number of homes, met people I never knew, started some relationships and renewed others. Meanwhile my wife was home dumping huge handfuls of candy into open bags, raving over costumes, inviting kids to come back and visit whenever they wanted, and entertaining other parents that I missed. It was a major community event and opened many doors for fruitful relationships we were able to continue the rest of the year. Not to diminish the reality of spiritual warfare--something to be taken seriously by all believers--but the last day of October is not a spiritual battle any more than any other day. If Satan comes out on Halloween, he doesn’t go back into hiding the next morning. Whether the origins of Halloween are pagan or otherwise, what we have today is a culture-wide event that glorifies pretending more than the underworld. It’s actually one holiday that adults haven’t taken over--the one time kids get to “be” whatever they want to be. Our participation--or lack thereof--in such a popular, cultural event is only indicative of our ability to have a good time with silliness, not a measure of our standing in a fight between good and evil. If Satan wins anything on this day, he may win more through the darkened homes of Christians than anything else. The truth is, Christians never have anything to fear--on this night or any other--or God is not God and His promises are not true. What we should be concerned about is a retreat from our homes, when, more than any other time, it’s important to be there with our lights on and a bowl full of treats near the door. If there is a darkness on Halloween night, I, for one, am going to at least make sure that it will not be on my block, at my house." My family does choose to take part in the fun and celebration of Halloween. We do not glorify the darkness and death that some choose to emphasize during this season but we do try to take this small window of opportunity to engage with our neighbors and the culture at large. 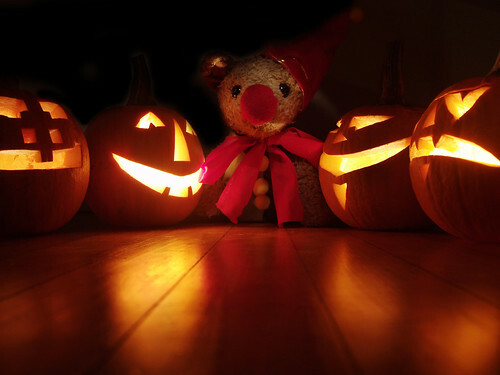 However you decide to handle Halloween this year, I hope you have a great time with family and friends. For another perspective that touches on some of the Christian origins of what we now know as Halloween, please click here. I must say, I was one of those christians that thought it was outright sin to celebrate Halloween. That was until my son came of age and was able to participate in the activities. This morning I sent him off to his "christian" daycare center as BatMan. He was so thrilled he could barely stop smiling. I was the same. I took lots of pictures this morning with plans for more. I was saddened by my prior conviction that this could in any way be harmful or dangerous. I thought, would my son have missed if I were a protester. Not to mention the embarrassment he would have suffered as one of the only kids without a costume. I am certain that if I were to hold to my prior beliefs I would not only lack any impact upon the culture, but I would damage my son and daughter and possibly cause resentment. What a memory to have, kids having fun and getting candy while you look out your window wishing that were you. This would be such a pitty. I don't take issue with those who choose not to celebrate. Do what you feel is right. However, I look at my own life and all I have is good memories of lots of candy and some pretty embarrassing moments (like when my homemade mummy suit fell apart and I was left walking the streets in nothing but long-johns). Despite the emberrassment and tooth decay, God was still able to get through to my heart with the Gospel. Trick or Treat! I choose not to celebrate Halloween. It's a decision that is between me and God, and I'm very certain that, for me, anyway, it's the right one. This really got me thinking about how a missed opportunity it is for personal Evangelism and Hospitality. Evangelical Christians in the UK do not "celebrate" Halloween which is a pagan pre-christian festival and wonder why US Christians, who take such hardline stands on other issues,continue to involve themselves in such a heathen and blatently commercial festivity. This is fascinating, and presents a challenging perspective. As (another) child growing up in the 60's in Massachusetts, my family was fully involved in Halloween. Home-made costumes were the norm, one year I was a space-man (wearing leotards, perhaps like those long-johns in fact). In my post-high school years, living in a devout community in California, we took evil very seriously and refused to participate in anything to do with the event. As well, during that time it became an excuse for mob activities in the cities, to the point of riots. Today, I see nothing in the regular festivities worth imitating- Halloween has become a celebration of evil and unholy things. You offer a good reason to utilize the occasion for outreach, however. Also, I've read of some faithful Christians dressing up as Biblical heroes (David, Moses) and witnessing for goodness in that way. I like those ideas, they have merit. Presently, I'm living in Japan, and there is no tradition of going house to house for treats. Many English schools arrange Halloween parties, which I refuse to do. The concept of evil is treated frivolously, the costumes reinforce that attitude, and I will not promote that perspective. I see nothing cute or beneficial in dressing up children as witches and warlocks, not after having dealt with real ones. I like your idea about using the occasion as an opportunity to witness. I don't see doing that here, however.